There's a lot to take in today. The new Nexus devices are official. There are two of them. And while both will ship with Android 6.0, folks will more likely get their hands on Marshmallow using older devices before the new ones start shipping. Around the time users start receiving their Nexus 5Xs and 6Ps, HTC says it will show off its own Marshmallow device. The company will announce its newest HTC One smartphone at 12 ET on October 20th. If we had to wager a guess, we'd say this upcoming device would be the previously leaked HTC A9. Signs point to a launch around that time for the relatively spiffy mid-range device. Why not release it with Marshmallow? HTC plans to update some of its existing devices by the end of this year, starting with its flagships the M8 and M9. 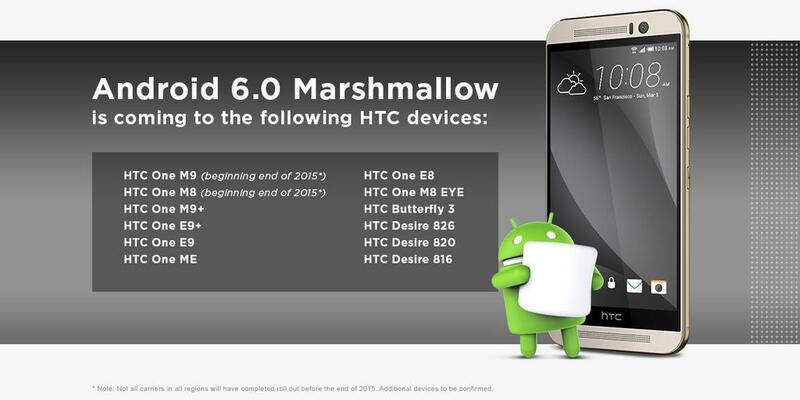 Numerous other phones listed can probably expect Marshmallow in 2016. These include the M9+, E9+, E9, ME, E8, M8 EYE, Butterfly 3, Desire 826, Desire 820, and Desire 816.